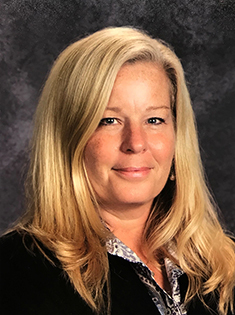 Doreen McSain, principal at Glenwood Elementary School in the Vestal Central School District, has been selected as the 2019 New York State Elementary Principal of the Year by the School Administrators Association of New York State (SAANYS) and the National Association of Elementary School Principals (NAESP). This award is given annually to a member of SAANYS and NAESP who is clearly committed to excellence, has programs designed to meet the academic and social needs of all students, and has firm ties to parents and the community. Since joining the leadership at Glenwood Elementary School almost ten years ago, McSain's priority has been to create a school environment where she would want her own children to attend, "a place where the adults and students value each other and where acts of kindness and consideration run rampant." To that end, her nomination by a large team of faculty, staff, parents, and students embodies her mission as an exceptional and compassionate leader. Noted fourth grade teacher Jessica Mirtallo, "Doreen makes parental and community involvement in the school a focus at Glenwood Elementary. Both families and students often comment on how wonderful it is to have these positive experiences at school." Commented parent Sanjiv Patel, "Principal McSain has created a culture of development, friendship, and dedication. You can see these and other core values all over the Glenwood campus. She has truly been an inspiration to the teachers and parents." One of the students described her this way, "You might think that Mrs. McSain is a special person, that is true. Believe me, she is." McSain considers herself the school's lead learner and is also known as a mentor who cultivates leadership in others. She and her teaching team have implemented several innovative programs such as a "Learning Through Play" program where students use an imaginative play space in order to practice social skills in a supervised setting; a "One Book, One School" initiative where the entire school reads the same book at the same time as a way to build community; and a dedicated "Maker Space" where all the children have the opportunity to engage in hands on STEAM time. Commented Glenwood School Counselor Stephanie Mitsakos, "Doreen is the heart of our building. Keeping open and honest lines of communication with her staff is a continuous priority. She has helped create and foster programs that have seen tremendous success." Noted Reading Specialist Tammy Wanck, "We teachers take pride in our accomplishments at Glenwood Elementary School because we have the support and understanding that, although our work is not easy, together we can make great things happen. This is all due to a great leader who is dedicated and passionate about providing a place we are all proud to call our school." Commented Assistant Superintendent for Instruction Laura Lamash, "I have often said that I cannot 'do it' without Doreen McSain. In her you find an educator who has committed her life to enriching the lives of students and teachers through creating a school where learning is joyful and friendships abound." McSain received her bachelor of science in elementary education from SUNY Cortland, her master of science in literacy education from Binghamton University, and her certificate of advanced study in school leadership from SUNY Cortland. McSain will be honored for her accomplishments at an awards ceremony on May 3 at the Century House in Latham, New York. As New York's Elementary School Principal of the Year, McSain will be celebrated as a National Distinguished Principal by the National Association of Elementary School Principals at a recognition program sponsored by NAESP this fall in Washington, DC.